There's nothing more important than the safety and happiness of your child. When it comes to buying baby products — whether you are purchasing a car seat, crib, high chair, or stroller, or even baby toys — following a few simple guidelines can ensure that your money is well spent. Cribs. While most new cribs should follow standardized safety guidelines, it doesn't hurt to double-check. Antique or older cribs should be checked carefully. Crib slats should be less than 2 3/8 inches apart to prevent heads and necks from becoming caught, and there should be no cutouts or decorations that the child could get caught in or snag clothing on. Hinges and screws should be out of the child's reach, and the safety latch should be childproof. 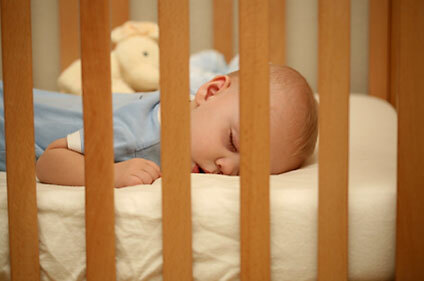 If you are considering an older crib, use a special kit to ensure the paint is non-toxic and lead-free. The crib mattress should be firm and should fit tightly inside the crib — if you can fit two fingers between the mattress and the side of the crib, your baby could become trapped there. Car Seats. 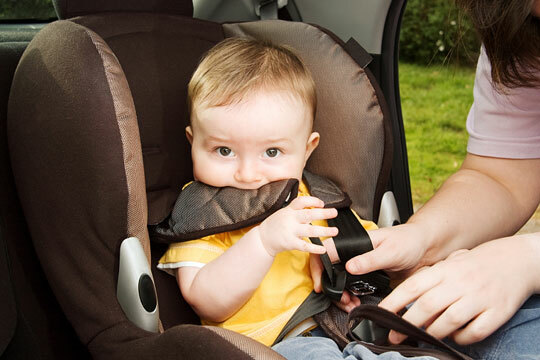 Car seats that conform to Federal Motor Vehicle Safety Standards are mandatory in all 50 states. There are several styles and types of car seats on the market, and the most important thing to consider when buying one is whether it is appropriate for the age and size of your child. Choose a car seat that fits your vehicle well and is easy for you to operate. Even the best cars seats won't do their job if they are used incorrectly. Finally, do not buy used car seats, because car seats that have been in accidents do not protect your child as well. In addition, after several years, the car seat material begins to break down and is not as strong. High Chairs. 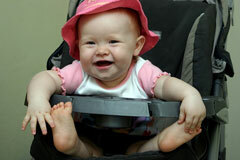 Most high chairs sold today are made of either wood or plastic (with metal frames). Traditional wood high chairs tend to be more durable and slightly more expensive, whereas plastic high chairs often store more compactly and may coordinate better with contemporary furnishings. 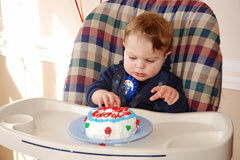 A high chair should have a wide base and should sit on the ground firmly without tipping. Make sure it has a good harness your child can't climb out of. If the high chair is collapsible, it should have a strong lock that keeps it from accidentally collapsing. Finally, make sure the surfaces are smooth and non-toxic and that there are no areas where your baby could pinch or catch his hands or limbs. Strollers. Traditional strollers have small wheels that are suited to paved surfaces and hard floors, while jogging strollers have larger wheels for smoother rides on rougher surfaces and at higher speeds. A stroller should be strong, stable, and offer a steady ride; it should not be able to tip over while the child is sitting in it. It should include a harness that prevents your child from falling out or climbing out. Its surface should be smooth and non-toxic, and there should not be any sharp edges, exposed hinges or screws, or areas where the child can pinch his hands or fingers. Make sure that the stroller has a convenient parking brake that locks at least one wheel securely. Toys. Safety is the most important consideration when selecting toys. For children under two, the item or any part that can be removed from an item should be no smaller than 1 1/4 inches across, otherwise it's considered a choking hazard. Toys with jagged edges, sharp corners, and pointy sides should be avoided. All toys should be labeled non-toxic, and soft toys should be labeled non-flammable. For more information about baby product safety, browse through the Child Safety information published by the US Consumer Product Safety Commission.